The poster for the "Endangered Season" exhibit includes a detail from Burke's work. Between 2006 and 2010, Brattleboro artist and Vermont State Representative Mollie S. Burke organized three exhibitions of poster art at Amy's Bakery Arts Café on the subject of climate change, energy conservation, and the need to reduce fossil fuels. Titled "The End of the Romance," these exhibitions attracted a variety of participants, including professional artists and elementary school students. The call for entries asked artists to create work encouraging people to change their consumption habits, and asking political leaders to enact emissions-cutting legislation. During those years, Burke felt hopeful that there was enough momentum and concern by citizens, the state, and our country to make significant changes in order to avoid the worst of the predictions accompanying rising global temperatures. She believed that visual art provided a powerful way to get that message across. Though her optimism is now tempered by recent scientific studies and more extreme weather events (including our own Tropical Storm Irene), Burke still believes that art offers a means to address the issue of climate change. To that end, she invited two artist friends, Joan Peters and Jude Roberts Rondeau, to participate with her in an exhibition focused on the threat posed by rising global temperatures and erratic weather to our Vermont winter. "Endangered Season: Winter in Vermont," currently on display at the Catherine Dianich Gallery through December 20, represents a sequel of sorts to the earlier "End of the Romance" exhibitions. However this new show has a narrower focus: a celebration of the Vermont winter and a call to consider the impact of climate change on that season. "Winter Moonlight in the Orchard"
There is much that celebrates winter in this exhibit. 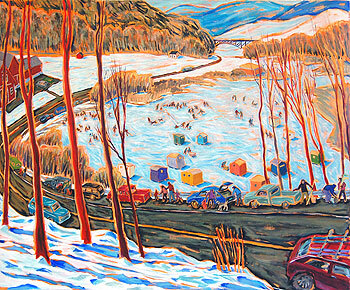 Jude Roberts Rondeau's painting "The Meadows" reflects her love of ice skating in what she refers to as a "beloved, iconic landscape embodying all the variety and richness of a Bruegel village scene." 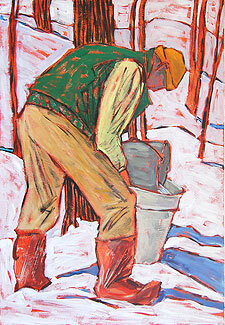 In another painting, "The Sweet Season," Roberts Rondeau portrays the traditional Vermont task of collecting sap from metal buckets for syrup making. Color is an important element in these winter paintings, with objects looking like jewels against a contrasting white backdrop of snow. 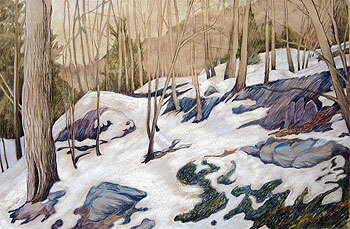 For artist Joan Peters, winter offers a visual delight, and a time of great clarity. The forms, shadows, and colors of her three landscape drawings are pure and sharp. She writes of a "fascination with snowmelt and waterways." Hers is a physical world, still and frozen, yet in motion. These works ask us to stop and notice the beautiful simplicity of forms that winter provides. Mollie S. Burke's paintings portray the mystery of winter tinged with melancholy. 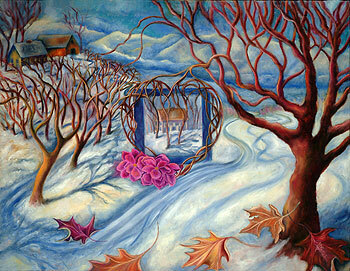 "Winter Moonlight in the Orchard" recalls a long-ago moonlit ski through a magical old orchard. 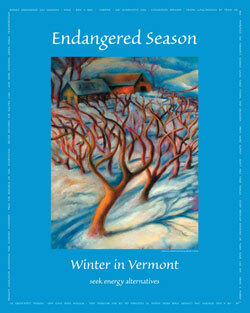 "Endangered Season II: Winter in Vermont" strikes a more discordant note, with images of Vermont winter activities like skating and skiing surrounded by melting water. This latter work references one of the purposes of the exhibit: to encourage people to consider the impact of climate change on the winter season. Several of Rondeau's painted posters do the same by using image and word to encourage energy conservation and reduction of carbon emissions. Her "Wheel of Fortune" invites viewers to spin a wheel to see the consequences of climate change on Vermont life. For Roberts Rondeau "it's inconceivable to imagine Vermont without a reliable, recognizable winter. So much of our identity, culture, and commerce is framed around our snowbound landscape." She believes that we need to be reminded of "the wonder and fragility of our beloved Vermont winters." Burke writes of her more than twenty-year concern about climate change. A winter enthusiast, she states that the current "unreliability of the season leaves me with a profound personal sadness, a sense of loss ... that pales when considering the larger picture, the scientific predictions for our warming world. The actions needed to address this are immediate, yet denial and procrastination currently have the upper hand." In the face of this reality, Burke believes that "we need to celebrate what we love, and may lose, in order to move forward." She thought of this exhibition as a way to do that, and to engage others in the conversation. Her hope is that the viewer "may find some beauty here, some experience of recognition, and be inspired: to celebrate any season, to consider how to protect it." Stop by during Gallery Walk on December 6 to meet the artists and see this inspiring work. Otherwise the gallery is open by appointment: (802) 380-1607.